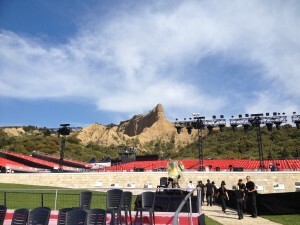 The Dawn Service site on the Gallipoli Peninsula. I had the privilege of attending the Anzac Day Centenary commemorations at Gallipoli this year, having been chosen to represent the country as one of 25 New Zealand Youth Ambassadors. It was an absolutely mind-blowing experience, and it brought the meaning of Anzac Day to life for me in a way nothing else ever has. The Youth Ambassadors were selected from all over NZ – most were chosen through means such as competitions and programmes and from the cadet forces. I was selected via the Minister of Veterans’ Affairs’ Passchendaele Multi-media Competition. We travelled as part of the official New Zealand Defence Force (NZDF) delegation to Turkey for the centenary commemorations on the Gallipoli Peninsula. As Youth Ambassadors, we had duties for the two services: we helped with crowd management (such as helping people find the right seats and facilities) and we walked with the crowds up to the Lone Pine and Chunuk Bair services after the Dawn Service (helping carry things for the public and trying to keep spirits up, as it was a 7km up-hill trek to the Chunuk Bair site). At the end of the Chunuk Bair service we helped with getting everyone loaded onto the right buses and off the Peninsula – quite an operation!. Prior to Anzac Day, we had also learnt and continuously practiced a set of songs to sing for the crowds as the stands fill up for the Chunuk Bair service. In the lead up to Anzac Day we went on two battlefield tours of the Gallipoli Peninsula, visiting war cemeteries (quite sobering, and an emotional experience at times) and walking some of the trails that the ANZAC troops had used 100 years ago. The trip offered four weeks of life-changing experiences, and I feel so honoured to have been in the company of the NZDF contingent and the Youth Ambassador contingent (consisting of our leader, our chaperones and my fellow Youth Ambassadors). I have met the most amazing people on this trip and have made life-long friends. I want to share with you my experiences and the insights that I gained while in Turkey regarding the Anzac legacy – I can prove to you that Anzac Day is more than just a holiday and that it is something that still affects us today. While I have always believed that Anzac Day is an important event to observe, I realise now that I had never fully understood it and so it was hard to connect with it – but this trip has changed everything for me. I wish that all New Zealanders could have the opportunity to visit Gallipoli themselves and see what we saw, but while that is impossible, I can write about it for you. That, I can do!